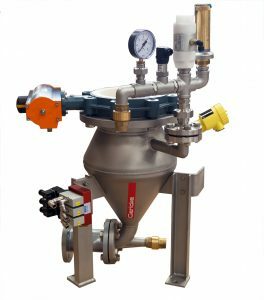 11.05.2018 The PTA/PHF 20 system from Gericke offers all the advantages of pneumatic dense phase conveying: Minimum air consumption; high product loading and throughput; little wear on the piping; and preservation of product quality. This system incorporates a small conveying pressure vessel of 20-liter volume which requires a headroom of only 660 mm and thus overcomes height restrictions limiting the installation of pressure vessels. It has a throughput of up to 1.5 m3/h and handles distances of up to up to 50 m. It is equipped with a level probe and additional air volume control makes conveying even more efficient. The dense phase conveying can be carried out either as product-gentle plug conveying or thrust conveying. The manufacturer‘s STP 61 machine controller ensures trouble-free and fast commissioning and maximum conveying efficiency. Furthermore, communication with higher-level control systems is possible via interfaces such as Ethernet/IP, Profibus DP, Profinet RT, and Modbus/TCP. The conveyor sender is particularly suitable for installation under sack tipping and big bag stations, dust filters, or storage containers. The sender requires very low maintenance as it has no rotating parts. It is also suitable as a replacement of more maintenance intensive rotary valves, which are used for lean phase conveying systems. As a continuous double-conveyor system throughputs of even 8 m3/h are possible. Depending on the requirements, different versions of the conveyor system are available, such as food grade, high-temperature, or wear-resistant versions and for explosive products. The compact system is suitable from fine powders up to granules of 15 mm. Even very light products with bulk densities of 0.1 kg/l up to very heavy steel balls of 5 kg/l have already been conveyed successfully. Conveyed products include sand, milk powder, nuts, salts, metal powders, additives, filter dusts, and blasting agents.